At the start of the school year the library is a central location in a school that has so much to share with incoming freshman students. We have procedural information, rules and regulations, and resource knowledge to share with an entire new group of students in a short class period. As things in our schools change, so does our orientation programs and the struggle for engaging delivery of information is real. As I dove into planning for this year my goal was to keep orientation fresh, engaging, and meaningful. The first step was revamping my Google Slides presentation. I updated my theme using a free template from Slides Carnival to up my visual appeal. Next, I added a fresh sweep of each slide. 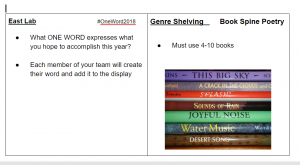 I looked at each slide for word usage, graphics, and information. Updating each slide as I went through the presentation was a great way to make changes and streamline my delivery of information. Now that my presentation was updated with a fresh look I started looking at revamping my activities. So much of my previous orientation was talking at the students and walking them through the library. I wanted to come up with something that was more interactive and required more from the students. Instead of a guided tour I changed to 2 challenge activities to get to know the library. Activity 1 involves the students finding our new “East Lab” area. I gave the students the option to work in a group or alone, just to give some added choice and comfortability. Task card 1 asks students to find the “East Lab” and use the whiteboard markers to write one word on the tables that is a goal for themselves this year. 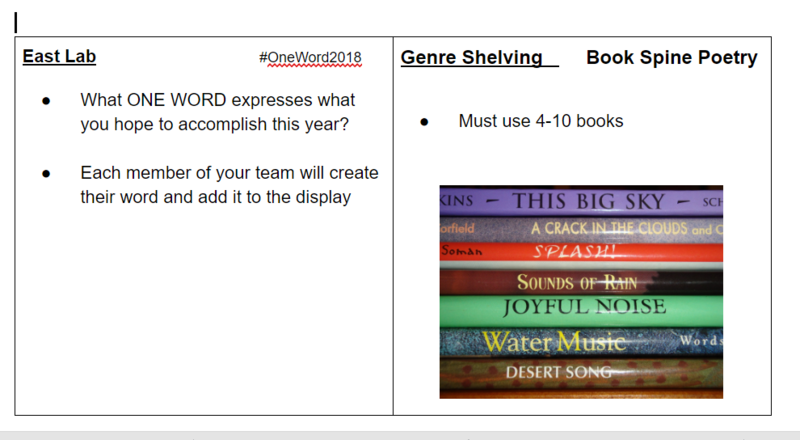 If they choose to they can take a picture of their word for social media and use the hashtag #oneword2018. Activity 2 involves the students finding our fiction book section. As in the previous activity students have the option to work alone or with a partner. Task card 2 instructs the students to find the fiction section and create a spine poem. My only requirements for this poem are that it uses 4-5 books and is appropriate for school. To cut down on books being mixed up on the shelves I limit the students to only the books on the “New Book” cart, which are much easier to re-shelve. After the initial informational presentation and the tasks are completed I wanted the students to have something tangible that really cemented our message in the school library. In the past I had given the students Halloween stickers or pencils from Target, but this year I really wanted the orientation “prize” to connect to what the library represents. 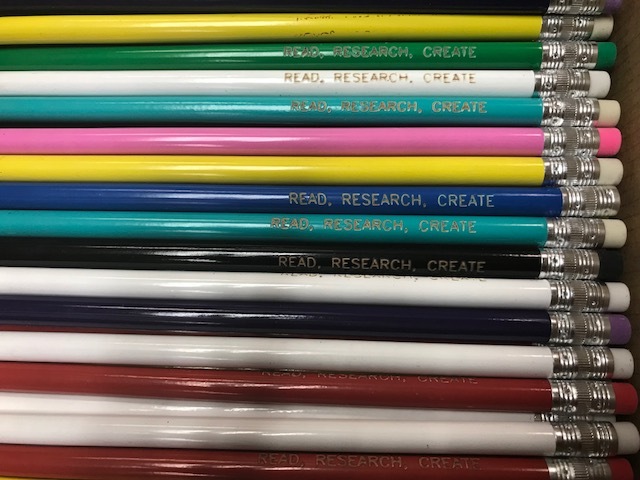 I chose to create custom pencils from Oriental Trading that had the words “Read.Research.Create” engraved on them. For the amount I needed I couldn’t find a better price. 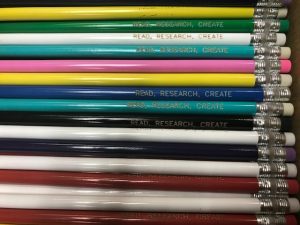 A disclaimer here: If you are very concerned about the quality of the pencil or the quality of the engraving this vendor might not be for you. I will tell you they are cheep for a reason, especially the quality of the engraving on some of the colors wasn’t great. As an additional side note these pencils do not come sharpened, so students will have to do that themselves. 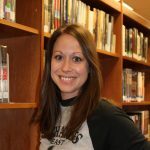 After all of this refreshing to my freshman orientation library program I am hoping to see a rise in student engagement, which will lead to a rise in student comprehension of library expectations and space locations. I look forward to seeing the students be more interactive with the library spaces and each other. I’m excited to see the students exploring the space independently instead of me acting as a tour guide. Keeping my freshman orientation fresh has me ready for a clean start to the school year.